As a special thank you to all our premium players (and higher) we have released a special calendar. In this announcement we'll shortly explain how it works. So it works the following way: Every day there will be a new reward to redeem. On the page you'll have to log in to your New Z account. It will check if you have premium. If you don't, you'll have to get premium to participate. Times are based on CET (Amsterdam time). A new day starts at 00:01 AM (CET). This means you'll be able to redeem your reward of that day ANY time between 00:01 AM (CET) and 23:59 PM (CET). Rewards we have added are for example; unique sprays, unique skin recipes (such as the new "Christmas Tree Heavy Armor and K. Style Helmet), GC skinboxes, GD skinboxes, Christmas items and more! Note: Even if you're not at home you can still claim your reward for that day! Just do it through your mobile phone! Please disregard this message. I got my prize. Added a little explanation video! I was right the first time. I'm only getting the normal rewards for my Extreme account. I have no idea what the problem is. All I know is, I follow the instructions, I have an Extreme account, I log in at the address you provided, but alas, no special item appears. That first day I received my normal daily log in reward. It happened to be a skinbox. For the last 3 days, nothing special, just the normal log in reward. As added information, I just logged in to the address provided, then logged in to my game. All I received was 10x Stanag Elite drums. Ayy thanks i have nearly 3 years lifetime premium and it paya out everyday! Best premium ever!!! I think you misunderstood how this works, this whole system is SEPARATED of the daily login system. On the website you actually have to log in, and REDEEM the gift of that day by clicking on it. ONLY then the reward will be sent to your game account. I hope These Chrismas K style and Heavyarmor Skin is just in the Calender, that would be awesome, so we Premium User will have some rare Skins! 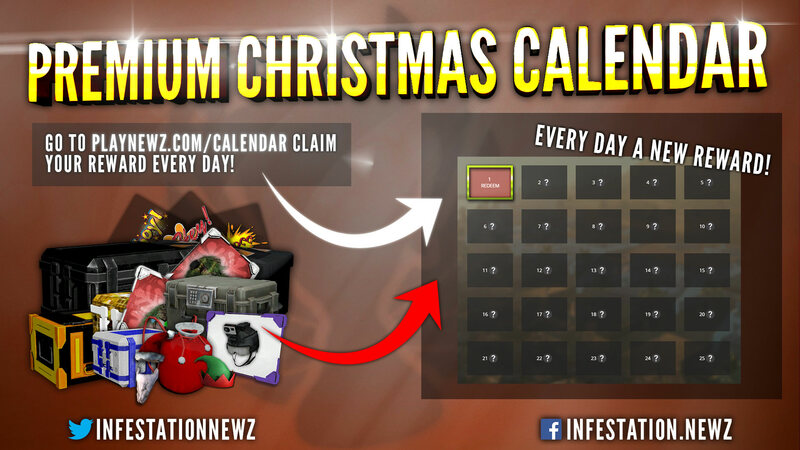 We have now extended the calendar till the 31st! Enjoy!